Thunderstorms aren’t usually catastrophic events; approximately 100,000 occur every year in the United States, and only 10 percent of them are severe. The average wind speed during a thunderstorm varies, and depends on temperature, humidity, topography and the phase of the storm itself. The speed is highest when the storm is producing the most rain and lightning. 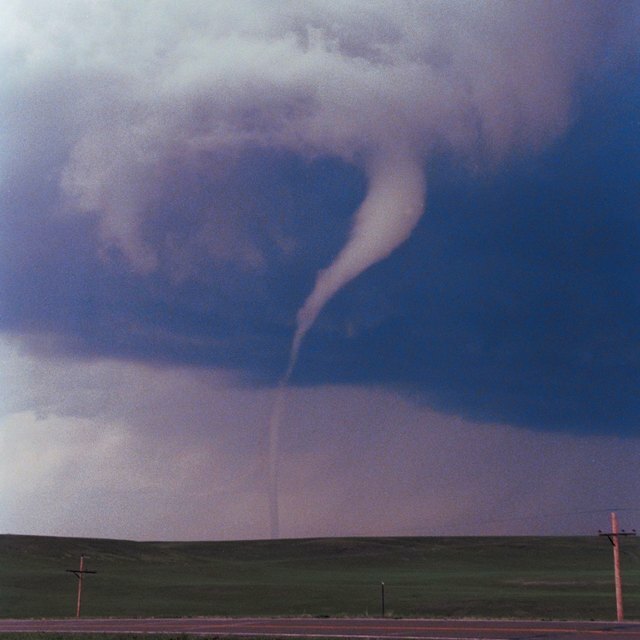 A storm earns the rating of a severe one when its wind speeds exceed 58 miles per hour. About 10,000 thunderstorms in the United States are classified as severe every year. This happens when the wind speeds exceed 58 miles per hour. The average wind speed during a thunderstorm varies, and depends on temperature, humidity, topography and the phase of the storm itself. Two wind movements occur during a storm: an updraft of warm air, which predominates during the formation and maturation of the storm, and and a downdraft of cooler air that becomes more prominent as the storm dissipates. The strongest winds occur during the midpoint of the storm, when these opposing are roughly equal. The modern version of the Beaufort scale includes 12 designations, each of which corresponds to a range of wind speeds. The designations 6 through 10 represent typical wind conditions during an average thunderstorm - 22 to 55 miles per hour. A thunderstorm requires warm, moist air and a mass of colder air that can push it upward. As the warm air rises, the moisture it contains cools, condenses and falls back to earth as rain. Meanwhile, the friction of air molecules rushing past each other creates an electrical charge that eventually discharges as lightning. Two wind movements occur during a storm: an updraft of warm air, which predominates during the formation and maturation of the storm, and and a downdraft of cooler air that becomes more prominent as the storm dissipates. The strongest winds occur during the midpoint of the storm, when these opposing are roughly equal. In 1806, Commander Francis Beaufort of the British navy transcribed his version of a wind scale that was already in widespread use, and meteorologists have used the Beaufort scale since then to gauge wind speeds. The modern version of the scale includes 12 designations, each of which corresponds to a range of wind speeds. The top two designate speeds typical of severe thunderstorms and hurricanes, while the other ten represent ascending velocity from dead calm to gale-force winds. In particular, the designations 6 through 10 on the scale represent typical wind conditions during an average thunderstorm. The speeds represented are from 35 to 88 kilometers per hour (22 to 55 miles per hour). The National Oceanographic and Atmospheric Administration classifies thunderstorms as severe when they are accompanied by hailstones larger than three quarters of an inch in diameter, and tornadoes or wind speeds of more than 93 kilometers per hour (58 miles per hour). Most storms, however, don’t have such strong winds. In fact, the winds in most storms never reach beyond the intensity designated by an 8 on the Beaufort Scale, which is fast enough to break twigs from trees and make it very difficult to walk against the wind. Wind speeds represented by an 8 are in the neighborhood of 54 to 64 kilometers per hour (39 to 46 miles per hour). A storm that goes from dead calm to a wind intensity measuring 8 on the Beaufort Scale would have, on average, a wind speed of approximately 32 kilometers per hour (20 miles per hour). The average speed of a severe thunderstorm that starts from dead calm, on the other hand, could have an average speed of 50 kilometers per hour (31 miles per hour). During the later stages, some storms exhibit strong downdrafts with winds that can top 161 kilometers per hour (100 miles per hour). These dangerous downdrafts, which exceed the maximum winds speeds of most storms and are as fast as tornadoes, pose hazards for aircraft. The Weather Guys: What Is the Beaufort Scale? Deziel, Chris. "The Average Wind Speed During a Thunderstorm." Sciencing, https://sciencing.com/average-wind-speed-during-thunderstorm-24075.html. 09 May 2018.